The Earth has already experienced a period of strong warming. About 252 million years ago, the Earth almost died. 96% of all species died in the oceans. It is more difficult to determine how many terrestrial species have disappeared, but the losses were similar. This mass extinction at the end of the Permian period was the largest in the entire history of the planet and lasted for several thousand years. 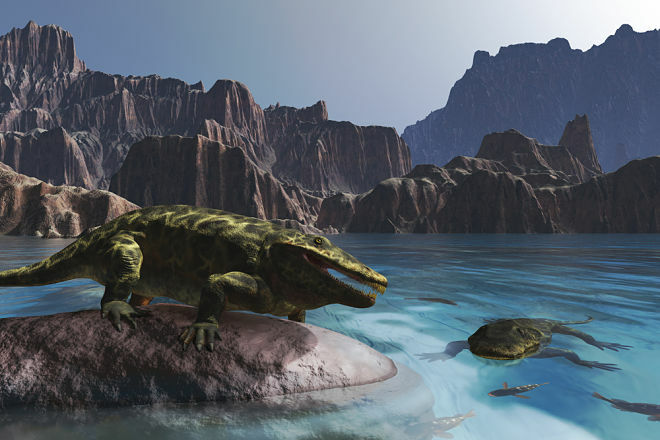 A team of specialists prepared a detailed report on how sea life was wiped out during the Permian-Triassic mass extinction. Global warming deprived oceans of oxygen, exposing many species to such stress that they died. And we can repeat this process, scientists warn. If so, then climate change “clearly belongs to the category of catastrophic extinction,” says Curtis Deutsch of the University of Washington, co-author of the new study. Researchers have long known the general concepts of the Permian-Triassic cataclysm. Volcanoes on the territory of modern Siberia began to erupt with great force. The lava they threw out produced a huge amount of carbon dioxide. Once in the atmosphere, gas began to capture heat. Researchers estimate that the ocean surface has warmed by 18 degrees Fahrenheit. Some scientists say that it was heat that killed many species. Others believe that heat reduced the concentration of oxygen in the ocean by stifling the species that lived there. A rock mass extinction era was formed when at least part of the ocean lacked oxygen. In his previous study, Deutsch explored how modern animals adapted to temperature and oxygen levels in the seas. Animals with a fast metabolism needed more oxygen, and therefore they could not live in those parts of the ocean where the oxygen level was below a certain threshold. Warm water made the test more difficult because it cannot hold as much dissolved oxygen as cold. Even worse, warm water can increase animal metabolism, meaning they will need more oxygen to survive. Deutsch and his colleague Justin Penn recreated the world of the end of the Permian period with the help of a large-scale computer simulation. When Siberian volcanoes flooded the virtual atmosphere with carbon dioxide, the atmosphere warmed up. The ocean also warmed and, according to the model, began to lose oxygen. Some parts of the ocean lost more oxygen than others. On the surface, for example, fresh oxygen was produced by photosynthetic algae. But as the ocean warmed, its circulating currents also slowed down, the model demonstrated. The oxygen-poor water settled on the bottom of the oceans, and soon the depths began to choke. Rising temperatures and falling levels of oxygen have made huge ocean bands uninhabitable. Some species survived, but most disappeared completely. Animals in oxygen-rich waters could not tolerate an unexpected decrease in oxygen, and those that lived in tropical waters were already adapted to low levels of O2. Cold-water species could not find shelter anywhere. A new study carries an important warning. The Siberian volcanoes, ultimately, threw as much carbon dioxide into the atmosphere as we will never produce, burning combustible minerals. But our annual carbon footprint is actually higher. The carbon dioxide we have thrown out over the past two centuries has already made the atmosphere warmer, and the ocean has absorbed most of this heat. And now, just like during the Permian-Triassic extinction, the ocean is losing oxygen. Over the past 50 years, oxygen levels have dropped by 2%. If we use all of the combustible minerals on Earth, the planet could warm up to 17 degrees Fahrenheit by the year 2300.